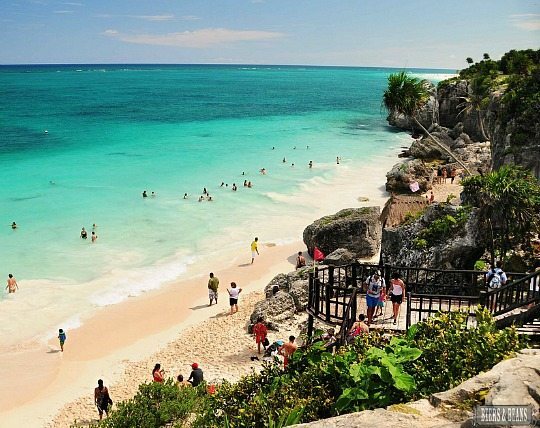 Caribbean turquoise waters, beautiful sandy beaches, Mayan ruins, lush jungle, and exquisite food await you in Tulum, Mexico. And you might want to take a few yoga lessons too! You can follow Beth as she is touring the Mayan Ruins of Tulum. 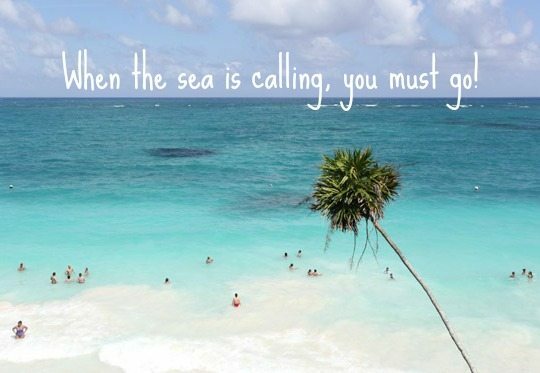 And if you need a break, hit up the beach for a swim in the beautiful warm water! 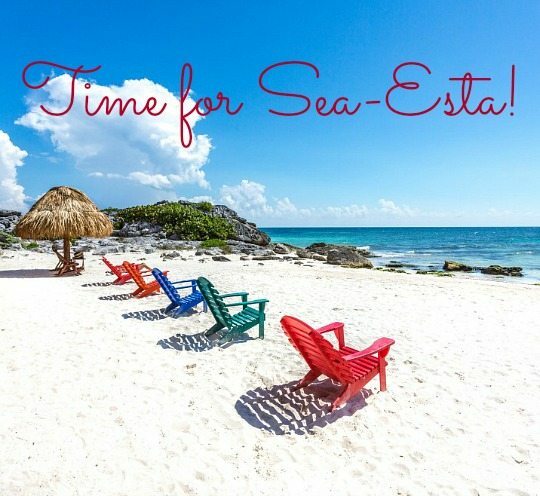 Amanda who writes the blog 100 Layer Cakes shares her Tulum Honeymoon Vacation. They stayed in one of the cute bohemian, eco-boutique hotels there. 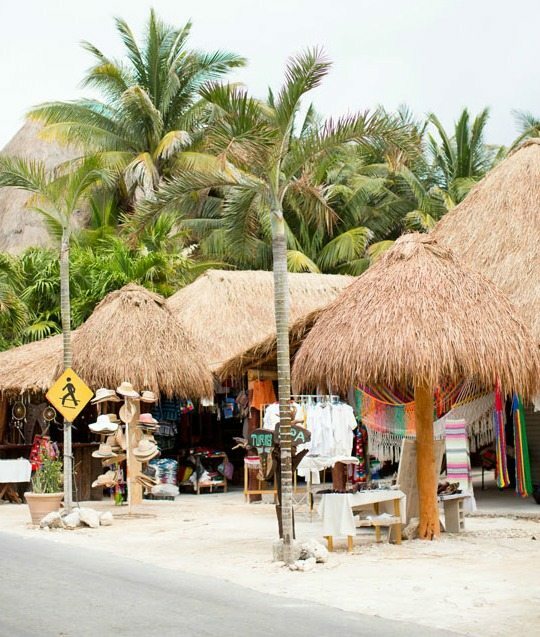 Sarah also snapped a beautiful photo of Tulum’s thatched roof houses along the beach. A peek into a cozy beach cabana at The Papaya Playa Resort via Jetsetter. 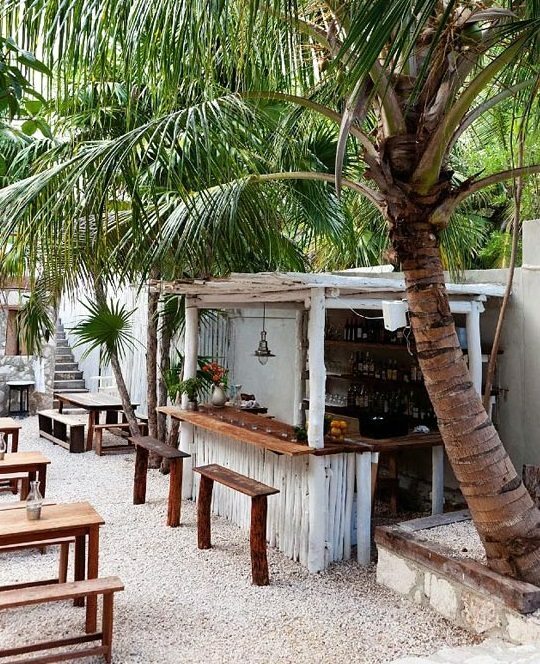 Hot spot Hartwood is reason alone to visit Tulum! The restaurant is owned by two New Yorkers who went on a vacation there and decided to stay. They serve the freshest most delicious food in a dreamy setting under thatched roofs surrounded by exotic plants, lights hanging from the trees, the scent of Mayan incense and wood grilled food filling the air. Photo via The Selby. For dinner or lunch by the beach, I’d head to the Zamas hotel. What’s not to love here? 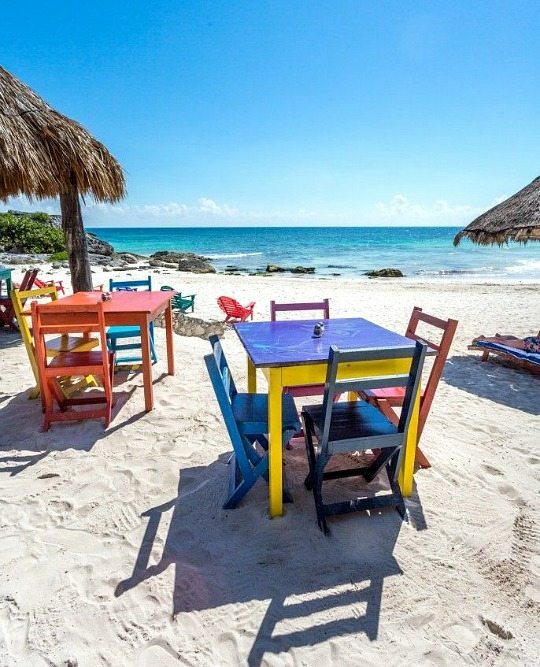 Gorgeous views, right on the sand, with Brightly Colored tables and chairs. Cheers! 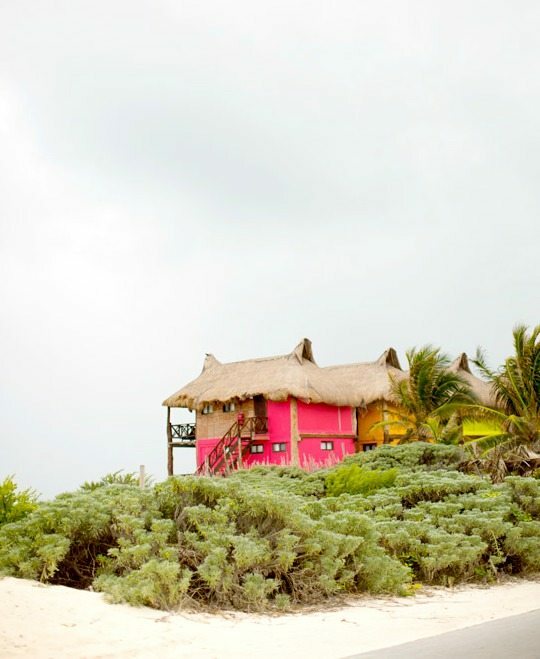 From Design Love Fest’s Tulum Travel Guide. 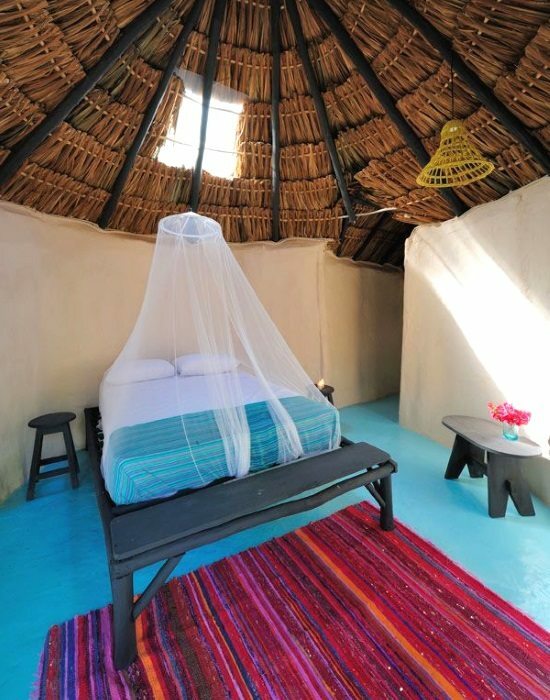 This small eco-chic bohemian resort town on the Yucatan peninsula might not be the secluded getaway it once was, but it is still a quiet alternative to other resort towns in the area (think Cancun to the north). Below is an excerpt from Fodor’s Tavel that describes Tulum then and now. Especially interesting: Tulum is off Mexico’s grid and generates its own electricity (… no street lights). 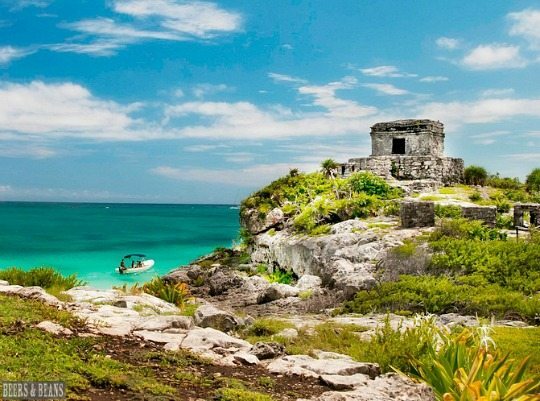 It used to be that Tulum was simply known as a Mayan archaeological site and dusty little town with a few palapa huts scattered along a 7-mile stretch of luscious beach. No longer. Discovered by the international eco-set, Tulum now has whitewashed, solar-powered bungalow hotels that line the spectacular powdery white beach 1 mile east of town. Chic boutiques and organic jungle restaurants quickly followed. In the last few years, tourist dollars have opened a new hospital, a giant supermarket, and the town’s first luxury resort, an anomaly in a protected beach town that still generates its own electricity.